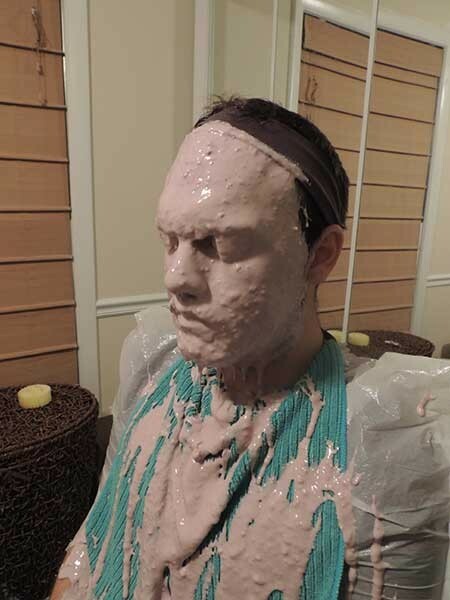 There was one brief moment in which Jordan Hoban began to panic, when he felt the wet alginate slowly dripping down his face and eventually clogging his nostrils. The rapidly drying, rubbery mold material already covered his mouth, so the nostrils were all he had left. Right on cue, artist Lara Americo and her partner Joanne Spataro began picking at the flesh-colored sludge in a manner that might be a bit awkward in any other situation, but in this case was an effective way to open Hoban's breathing passage back up and let him return to a calm state of mind in his newfound shell. Soon, Hoban's entire face would be covered, then wrapped in plaster bandages. He would sit there listening to a Silver Jews album he had picked just for the occasion, trying not to laugh at Spataro's wisecracks for fear of cracking the mold as it dried on his skin. 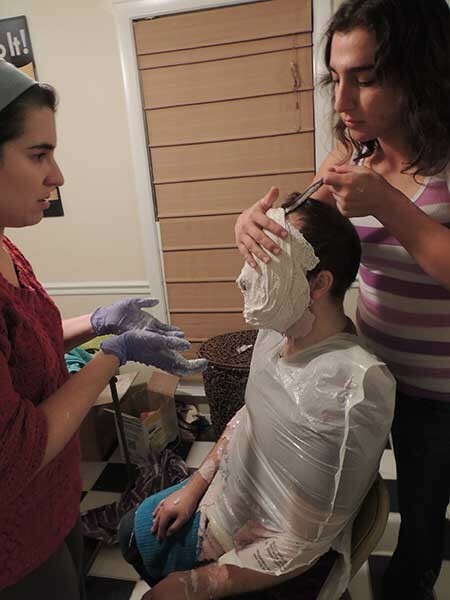 The whole process was just another day at the office — or in this case, the kitchen — for Americo, who has been creating molds of different people's body parts in preparation for her first art showcase Chrysalis, which runs at C3 Lab from Jan. 6 to Jan. 20. 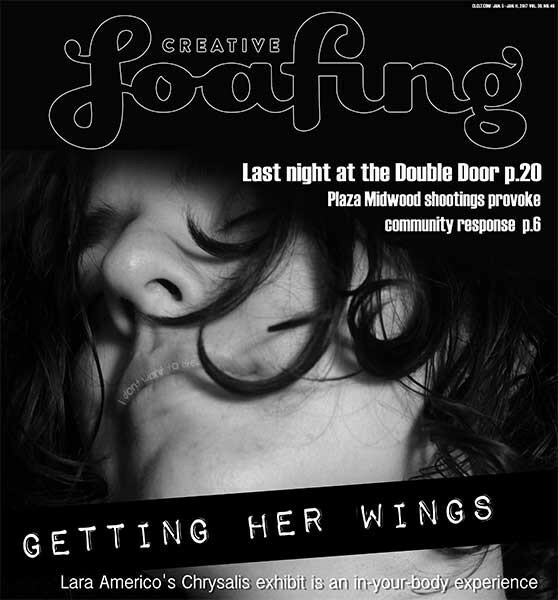 The 3D molds are just one part of the exhibit, which was born of Americo's 10-part "Trans and Queer in the Workplace" photo essay that has been featured every other week in Creative Loafing over the last three months. The series, reminiscent of Brandon Stanton's Humans of New York, features transgender and non-gender-conforming residents of Charlotte in their work environment. It includes jobs ranging from organizer to paramedic to professor. C3 Lab cofounders Maria and Glen Nocik came across the interview with Americo that ran alongside the photo series' debut, and immediately decided they wanted to learn more about her work. "I thought it would be so neat to get the pictures out of the paper and into a space where people could see it in a gallery, where people could be able to see it more," Maria says. "I thought it would make an impact for people to see it all together so people would know and be aware that these people are there." During their first sit-down with Americo, the Nociks immediately realized her potential as an artist of multiple mediums. "We wanted to kind of challenge her to express her artistic forms," Maria Nocik says. "She's also a [musical] performer and she's an activist, and I think giving her the opportunity to expand and get her message across on many different levels, I think that's the main thing that we wanted to do." 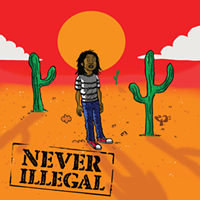 While the original idea was to possibly integrate "Trans and Queer in the Workplace" into a show that was already planned, after that first meeting the Nociks insisted Americo showcase her talents in a solo show. They asked if she had any ideas for artistic works that could be relevant to the photo series, and quickly learned that Americo is never short on ideas. The resulting exhibit — or exhibit within an exhibit, as Maria calls it — was titled Chrysalis, named after the late-stage shell of a cocoon that holds a butterfly just as it transitions into adulthood. Chrysalis delves into issues of the body, identity and acceptance. Along with "Trans and Queer in the Workplace," the exhibit will include a second photo series featuring close-ups of body parts and a selection of molds of body parts manipulated artistically by Americo to strip the mind of any past associations with said body part and look at it anew. For Americo, the entire exhibit is an expression of her ambiguous thoughts about the human body and her opinion that it does not effectively portray the person that resides inside it. This view comes from Americo's experience as a transgender woman. "My own transition just made me consider my own body in a different way that led to me considering other people's bodies in a different way," she says. "I realized that I'm not really this body no matter how much I change it or what I do to it, and neither is anyone else. It's just sort of this puppet we use to get around on Earth. That's how I see it." Americo's close-up photos, such as the one of Spataro's face feature on the cover of the you're currently holding, were intentionally left dark to draw the viewer near and force them to truly contemplate what they are looking at. Within the photos, she's interspersed text quotes taken from video interviews she carried out with subjects, a similar method to the one used in "Trans and Queer in the Workplace," in which each photo is accompanied by a quote from the subject. She'll take things further with the new photo series, attaching mementos to the frame of each photo that have meaning to the subject. It's all a part of Americo's attempt to look past the body to capture the spirit of each subject she portrays. "Without words, a photo is open for a lot of different interpretations," she says. "Words can get in the way of that interpretation, but I think in this case it's important to have the words from that person, because words are another physical manifestation of people and how they express themselves and who they are. The idea is to capture every bit of physical expression that I can from them, and words are just another part of that expression." The lengths to which Americo is willing to go to capture all she can from her subjects has been an inspiration to some of those subjects. While Hoban sang Americo's praises for keeping him relaxed throughout his facial molding process, for some the project went deeper than that. 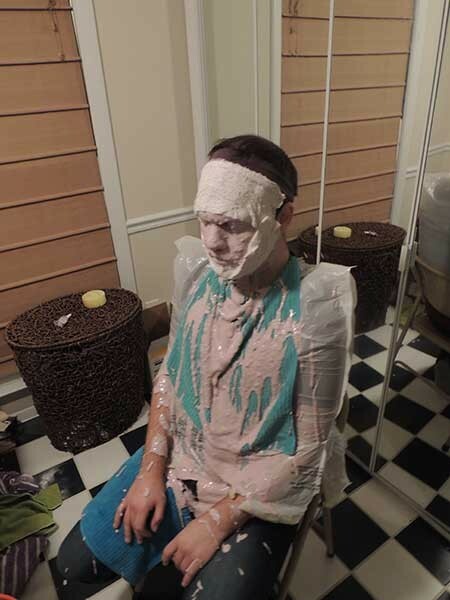 Nina Castellano, who was on hand to watch Hoban go through his facial molding before she had her own breasts molded, says she decided to participate in the project on short notice as a way to confront aspects of her personality she'd like to change. "I'm super, super shy," she says. "That's a body part I don't really show off a lot so I thought it would be interesting to be a part of it and just get out of my comfort zone." Watching Americo work with her subjects over the last couple of months has made a believer out of Spataro, who can be her biggest fan and loudest critic. Spataro, who calls herself over-complicated, says she was skeptical of Americo's newest photo series because of its seeming simplicity. As she watched her partner work, however, it became clear to her that something much more profound was at hand. "It would seem so simple to be like, 'Oh this is about how you're not your body," Spataro says of her initial reluctance to get behind the project. "I just thought it was too simple. But once I saw the people coming here in the foyer and how much it affected them and how they were so empowered by having a body part featured or photographed; it was like they were empowered because someone was really taking the time to look at them. And I think that's what a true artist does. She's inspired me very much with this project." What some of the subjects perhaps don't know, however, is that she's not done with their body parts once they've walked out the door. For Hoban's mold, for example, some of the most interesting work didn't begin until he had long left his likeness behind. 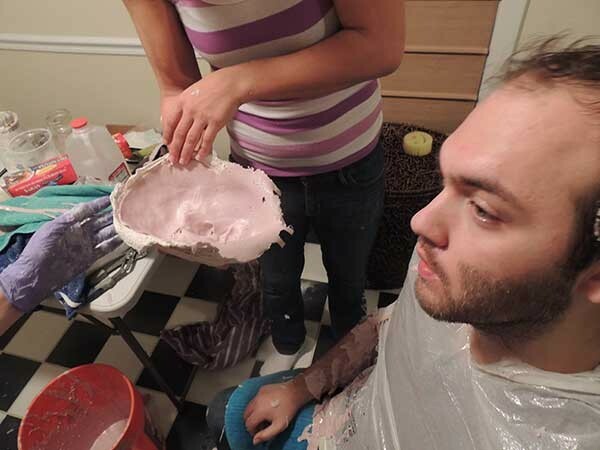 Once the alginate dried on Hoban's face in about 15 minutes, Americo peeled it and the plaster bandages off — the coconut oil applied to his facial hair helping to prevent any uncomfortable sticking — and then filled the newly created mold with plaster of Paris to create a 3D model of Hoban's face. The plaster was left to dry overnight, and later Americo would decide what abstraction to make of the face. She often doesn't decide until she can look at the finished product and let the inspiration hit her. With Hoban, she decided to cut his face into pieces horizontally. As with her photos, the idea was to force viewers to reckon with what they were looking at in a new way. "Seeing a face broken up like that when there's so much realism, it makes you consider what it's like when it's put together," Americo says. "When a person sees a face, their mind goes back to the past and all the faces they've seen and it creates an interpretation with the past faces they've seen as well. I think when it's broken up like that — with other body parts too — it makes them really look at it without putting that past reference and attachment to the face." 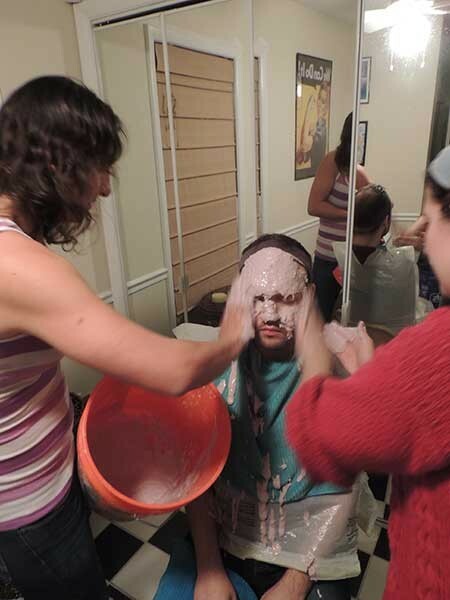 What she didn't expect, however, was how awkward things would become between her and Hoban's newly hardened head cast. The process of slicing the head up would take hours, but it didn't take long for her to realize it was going to be an awkward project. 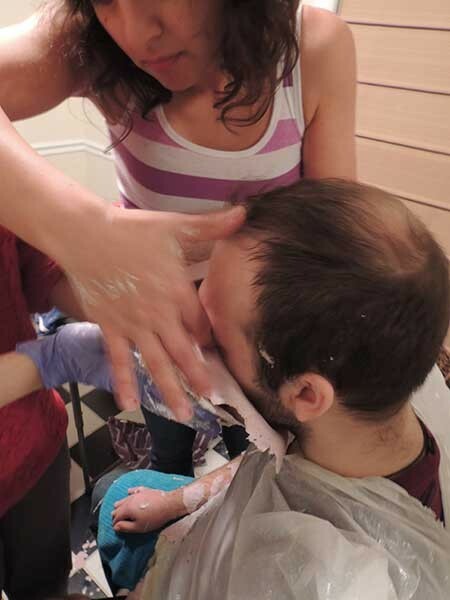 Americo said she got sad and could only look at the plaster forehead as she cut pieces out of the face. "It was so weird," she says of slicing up her friend's face. The violent part is over, now it will be up to the viewer's eye to put it all together again.